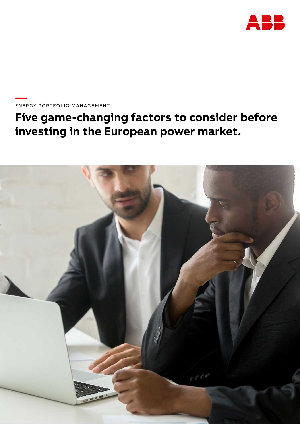 > ABB > Five game-changing factors to consider before investing in the European power market. Many in the United States’ power generation industry no doubt long for the relative market tranquility of the late 20th century. The generation plants built and operated then were carbon-fueled or nuclear-powered, with a few hydro-electric plants sprinkled in. The economics were largely stable and predictable, often thanks to regulation that shielded utilities from market fluctuations. But even in those simpler times, when the market was far less volatile, there was still much due diligence required when investors and developers were considering multi-milliondollar commitments in new generation projects. Today’s market is more volatile, due in large part to the disruptive effect of low-cost natural gas and the subsequent, rapid growth of affordable renewable energy. As more uneconomical and inefficient generation plants go offline, there is, for the most part, sufficient carbon-free or carbon-reduced generation to meet the growing demand for electric energy. There are pockets of growth areas in the country (e.g., ERCOT) that continue to exhibit strong demand. To replace shuttered plants and meet growing power demands in recent years, there has been a development frenzy in wind, solar and other clean-generation resources. Deciding whether or not to enter the market with new energy projects is not a clean-cut issue. Investors and developers interested in determining a project’s viability and optimizing profitably face a daunting set of calculations. Market shifts, changing legislative priorities, regulatory mandates, and evolving technology are only some of the variables that must be considered.